November | 2013 | JUDDER! As you’d expect, there are loads of great photos appearing already, and I have the first 200 (!!) on the Judder Facebook and in the Judder website gallery for your entertainment and delight. We are still expecting a bunch more from Michelle, our roving photographer par excellence – but if you have any photographs you’d like to share, you could win free entry to the next Judder! Just get in touch with us via the Facebook group, share and win! And so, we have one more Judder left this year, and we plan to go out in swashbuckling santa style as we unleash our PIRATE CHRISTMAS JUDDER on Friday December 6th! 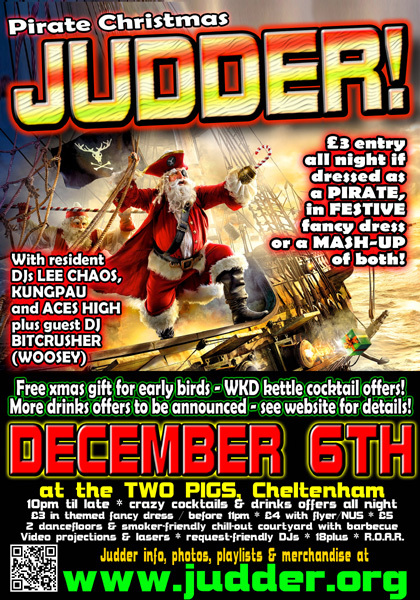 There will be drinks offers aplenty, and xmas treats for all the naughty and nice girls and boys, and it’s just £3 entry if dressed as a pirate, in Christmas fancy dress, or a mash-up of both! Make sure you invite all your friends from Halloween and let’s see the year out in style! If you can’t wait that long, then why not pop along to the Guildhall in Gloucester this Friday 15th November where I will be playing a special warm-up DJ set supporting Dreadzone. Should be a banging night out! Oh, and keep your diary handy as we are about to announce the dates and themes for 2014 too! Just a quick note to say that there is a BIG update on its way with all the photos of the AMAZING costumes from JUDDER’S HALLOWEEN SPECTACULAR – however, I’m a little behind as I will be DJing opening for The Orb at Gloucester Guildhall tonight (Wednesday 6th November)! Come along and say hello! If all is well I shall have some photos of the mayhem for you on Friday!